Right after my husband and I were married, we went on the hunt for some furniture that was inexpensive and easy to move. We knew we would move a few times before buying a house together and really settling in, but we also needed somewhere to sit in the meantime. We especially needed chairs so, after researching and reading reviews, we decided to buy an oversized bean bag chair. Oscar resting in his oversized bean bag chair. The bean bag chair seemed even to us like an odd purchase for two married professionals in their late twenties, but it was fun and really practical at the time. It was great for lounging in front of the television, reading a book, or even working on my laptop. My husband’s computer and the TV were in different rooms so, depending on which room he was in for the evening, I could grab my book and the bean bag chair and hang out in the same room as him. When we had guests over, the bean bag chair provided extra seating since we could move it into any room in the house. I really liked the bean bag chair and was happy with our purchase overall, but it did have some drawbacks. When it first arrived, it had a slight scent to it. It wasn’t an overwhelming smell, but I’m weird about smells and it took some time to air out. Also, I prefer chairs with a back most of the time, so the bean bag chair was comfortable but not always my first pick if the sofa was available. Last year, we finally bought a house and had some more comfortable furniture to sit in, so we stopped using the bean bag chair as often. Then, last May, we brought Oscar home. On our first full day with Oscar, we realized we needed a place where we could sit with him and cuddle without worrying about him jumping off and hurting himself. He was really young and scared with extremely abrupt movements, so we never knew if he was going to stay still, run, or jump. Even to this day, Oscar will be napping and then will wake up and immediately leap up and run off, so having him up high on a bed or couch is dangerous. 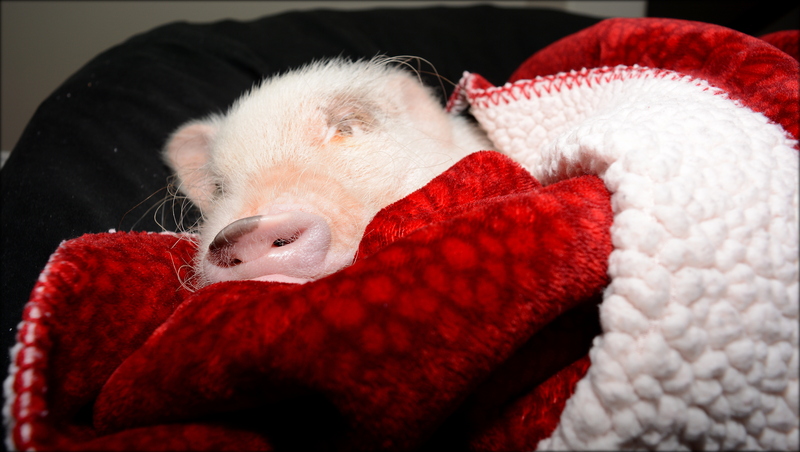 Mini pigs are top heavy with short, little legs, and they can easily injure themselves by jumping down from a chair, sofa, or bed. On top of that, it’s difficult finding a mini pig veterinarian who can help in case of an injury. We looked around the house for a chair that was comfortable but also lower to the ground than the sofa, and we realized the bean bag chair was a perfect option. We dragged the bean bag chair out and gave it a try for Oscar’s cuddle time. Oscar loved the bean bag chair! In fact, since we’ve brought Oscar home, we have used the bean bag chair daily. Oscar and I cuddle almost every night in the bean bag, and I can spend time with him while still reading or working on my laptop. If he hears the fridge or something that makes him jump up and off the chair abruptly, he is still low enough to the ground that he can climb down and then back up safely. This is where Oscar and I spend almost every night. He loves cuddle time in the bean bag chair! When we can’t cuddle with Oscar in the bean bag chair, he will climb up on his own and nap in the evenings. We leave his blanket and a pillow on the bean bag, and he likes to root around until his blanket and pillow are in the right place. Once he’s settled, he can rest there happily for hours. I liked the bean bag chair before we got Oscar, but now I love it because it’s safer for him and it allows us to get tons of cuddle time in with him. Watch as Oscar climbs into his bean bag chair for a nap. Below is the brand of chair that we bought and really like. Since we bought it about five years ago, I’m not positive this is the exact version, but it’s the same brand, color, and twill material. As I mentioned above, it did have a scent to it initially that has completely worn off now but took some time to air out. It isn’t likely to be the most comfortable chair you’ll ever own, but it’s awesome if you’re looking for a chair to sit in and cuddle with your mini pig. Since we bought our bean bag chair, we have dragged it from room to room frequently over the past five years, moved houses with it twice, and now have hooves prancing all over it, and the fabric has held up perfectly with no tears or even much sign of wear and tear. 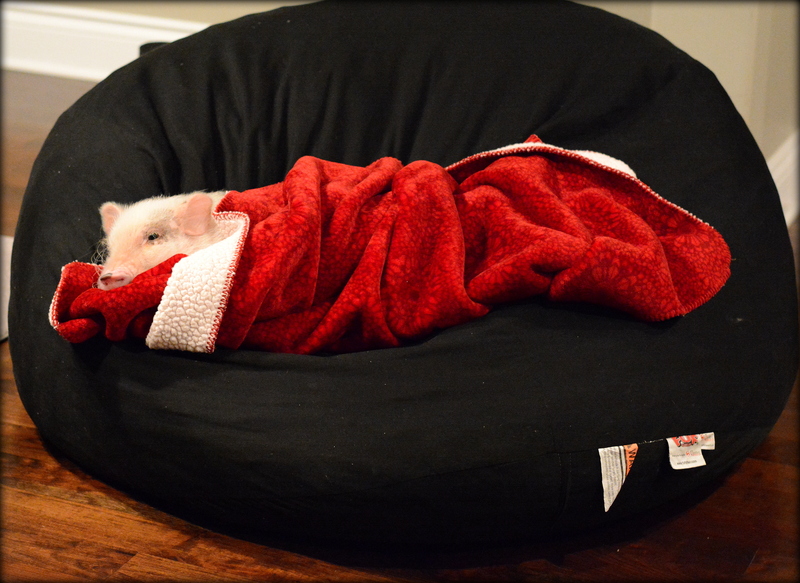 If you’re interested in buying a bean bag chair for your mini pig, I recommend measuring and doing some research to find one that you like best. 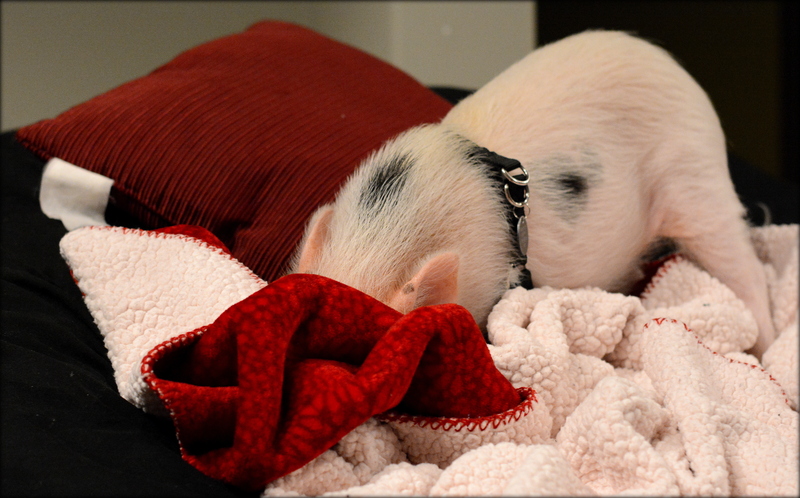 One thing to consider is your fabric choice, especially if you have a young mini pig. We’ve been really lucky in that Oscar has never peed on any of our furniture, so we trust him on the bean bag chair. That being said, it would be a disaster if he did ever pee on it. Although the outside fabric is advertised as being washable, I don’t think there is a lining holding the insides of the bean bag chair in, essentially making it not washable. If you’re concerned about your pig peeing on the bean bag chair, really do your research on the fabric type and how washable the chair is. Another option is to cover it with a trash bag or other type of similar material as a backup until you completely trust your pig on the chair. Oscar rooting around in his blankets to get comfortable. 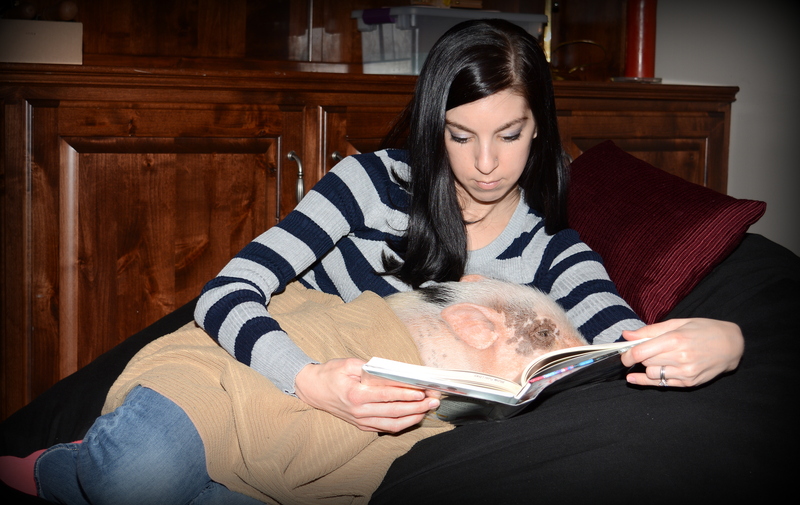 If you’re looking for a place to sit and cuddle with your mini pig, I highly recommend a bean bag chair. Not only are they convenient and easier to move from room to room than most chairs, they sit lower to the ground and are much safer for your pig to climb on and off of. 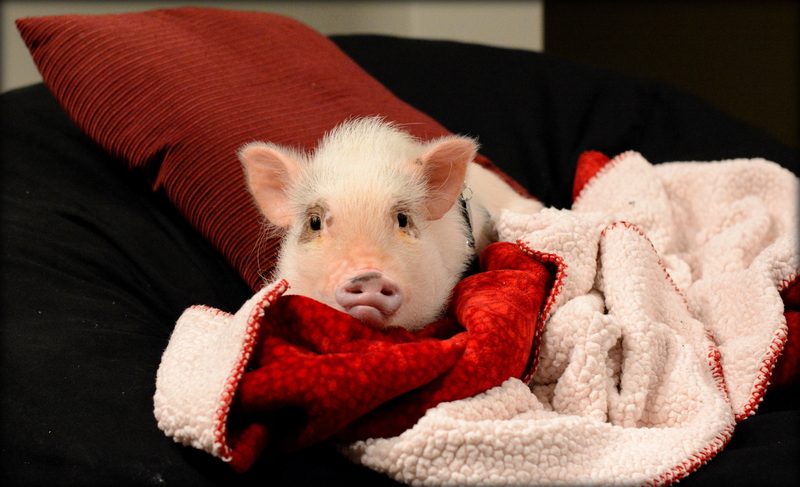 If you have a bean bag chair or other type of comfortable, safe chair you like to sit in with your mini pig, please feel free to share in the comments. Oscar happily sleeping in his bean bag chair. Note: Although I personally recommend the item discussed in this post, the link above is an affiliate link. LifeWithaMiniPig.com is a participant in the Amazon Services LLC Associates Program, an affiliate advertising program designed to provide a means for sites to earn advertising fees by advertising and linking to amazon.com.